Disable Browser Plugin in Google Chrome, Internet Explorer, Firefox in seconds. One of the major cause of Slow speed in Browser is too many plugins. Whenever you start any Browser in your PC or Laptop those Plugins which is installed also starts Running. And the more plugin will be running in the Browser Task manager, More memory usage will increase. So, in today’s article, I will show you the Easiest Way to Disable Browser Plugin. Let’s get Started. But First, let me clear everything about Browser Plugins to you so you can understand the things I’m talking about. 0.1 What Is Browser Plugin or Extension? 0.2 Do Plugins Really Slow Down the Browser? 0.3 How to See the Running Status of Plugins or Extensions in Google Chrome? 1.1 How to Fix the “Plugin is Protected by the Browser, you can’t disable that”? What Is Browser Plugin or Extension? Browser Plugin or Extension is a Software that adds new features to Browser. Most Web Browsers has less and limited features for users. And this is obvious because every Web Browser developer wants to make their Browser Faster by implementing limited features and functions on it. But still, they have given us a way to get beyond those default features. And that’s through adding Plugins or Extensions. Plugins or Extensions are usually low in size that adds a unique feature to Browser (Chrome, Internet Explorer, Firefox). Now, I have pretty much explained about Plugin. Let me clear you little more about it. Do Plugins Really Slow Down the Browser? Yes! It actually increases the load on the Browser and takes RAM and Processors to run in the Background. Adding Plugins or Extension in the Web Browser can slow down the Browser. However, whenever we add a plugin in the Browser it starts Running in the Background after Activating. Also, it increases the Browser Usage in RAM, CPU and Disk Space. And the best way to prove my saying it to watch Task Manager of Browser after Adding a new Extension. Most Web Browsers like Mozilla Firefox, Opera Mini, doesn’t have Task Manager. But You can try this in Google Chrome Browser because it has a Task Manager that comes inbuilt. Let me show you how to get the Running status and details about the Extension or Plugin that you have added in your Browser. Read Also: How to Easily Load Website Faster You Visit in 2018 – 5 Tips! How to See the Running Status of Plugins or Extensions in Google Chrome? Firstly, Download and Install the Google Chrome Browser if you haven’t from here. Open it up and click on the three Dots from right top to explore the Options and extra settings. Move your Mouse Cursor to More tools and don’t move until next navigation opens. In the sub-navigation of More Tools, select Task Manager and wait for it to open. Now, you can see memory Footprint, CPU, and Network uses of all the things that Running in Google Chrome like Plugins or Extension. That was the simple process of starting a Task Manager in Google Chrome and Analyse things to enhance and fix the performance issue. Now, let me show you to Disable Plugin or Extension in Browsers. Note: The Steps that I’m going to provide you will help you to disable Plugin or Extension in all the Browsers like Internet Explorer, Mozilla Firefox, Google Chrome, etc. 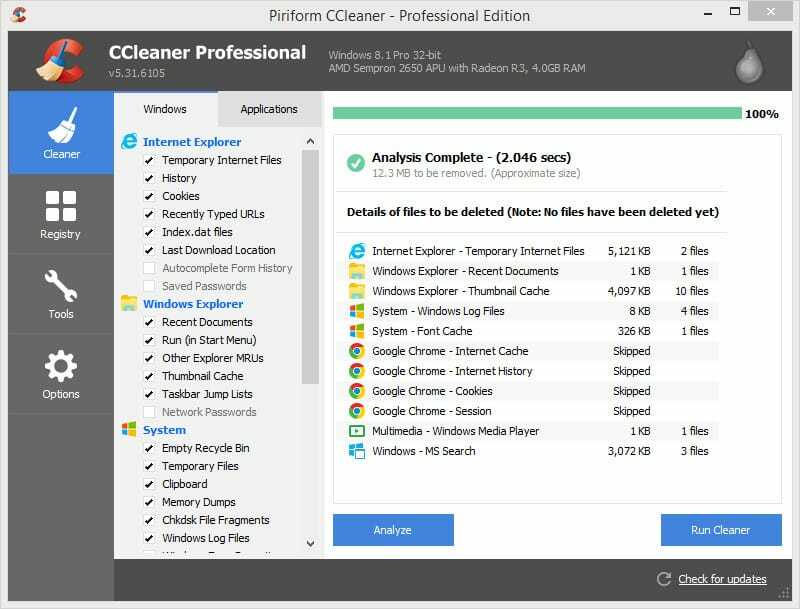 Download and Install the Ccleaner Software in your PC or Laptop. This is the very first step that you have must do In order to Disable or Remove Plugin. Ccleaner has the ability to Disable Plugin or Extension in Browsers instantly. Open the Ccleaner and Go to Tools section. When you successfully download and Install the Ccleaner, its time to start it and move to tools section. Click on Browser plugins Tab and select the Browser you want to remove Plugin from. In the tools section, you will find a tab called Browser plugins. Just hit the cursor on it, then you will get three Browser options Internet Explorer, Mozilla Firefox, Google Chrome. Just select your Browser and follow the next step. After selecting your Browser, you will find all the plugins that you installed in it. In a Seconds of clicking the Browser option, all the Plugins which is active on Browser will come to the screen to activate. Select the Plugin or Extension you want to remove and then click on “Disable Button” from the right action bar. That’s the simple and straightforward way to Disable Plugin in Browsers like in Internet Explorer, Google Chrome, and Firefox. Always Remember, some plugins will be protected by the Browser but you shouldn’t worry about that. Because I’m going to guide on that too. How to Fix the “Plugin is Protected by the Browser, you can’t disable that”? Start the Browser on your PC. Deactivate the Plugin or Extension from the Plugin bar or area. Open Ccleaner in Administrator mode and And delete the Plugin from Browser plugins section that exists in Tools area. This one is the easiest process to Remove Plugin that is Protected by the Browser. More plugins in Browser can slow-down the Performance and capability of your Browser. And the best option you have is to disable the plugins that you use rarely. This will free up the load on the Browser and improve your Surfing and Downloading experience on the Browser. Ccleaner is a Good tool that is popular for cleaning registry, caches on the computer, laptop. It also has tons of tools for PC which you can take advantage like Uninstaller, Plugins Remover, etc. CCleaner is the best option for all the users who want to Disable Browser Plugin like in Google Chrome, Internet Explorer, and Firefox instantly. Disabling Plugins in most Browsers are a complex process because the option of removing a Plugin exists in the Deep setting. But CCleaner will make it easy here for you. In two or three steps you can disable them without any issue. Hopefully, you loved this article? If so, just thanks us in the comment section and share this with your friends and family if you really found it useful or helpful.